We conduct studies and surveys to stay up to date with our employees’ change readiness, well-being, and commitment, as our success depends not only on what we are doing but on how we are doing. In 2017, we planned and implemented a new “People survey” program to monitor business critical changes continuously. To strengthen the how aspect, we will develop our management system, and implement a new more user-friendly platform for the system in 2018. In November 2017, we conducted a short employee pulse survey to gather insight on the strategy and safety issues. This survey complements the more comprehensive Forward Survey conducted in 2016. The Pulse Survey results help us evaluate the effectiveness of our development actions, and identify areas in which we could offer teams fresh insights to support them in continuous improvement. The percentage of positive responses to strategy-related questions remained at a high 84% (2016: 84%) level compared to a global benchmark. The percentage of positive responses to all safety-related questions increased, the average reaching 84% (2016: 81%); also at a good level compared to the global benchmark. 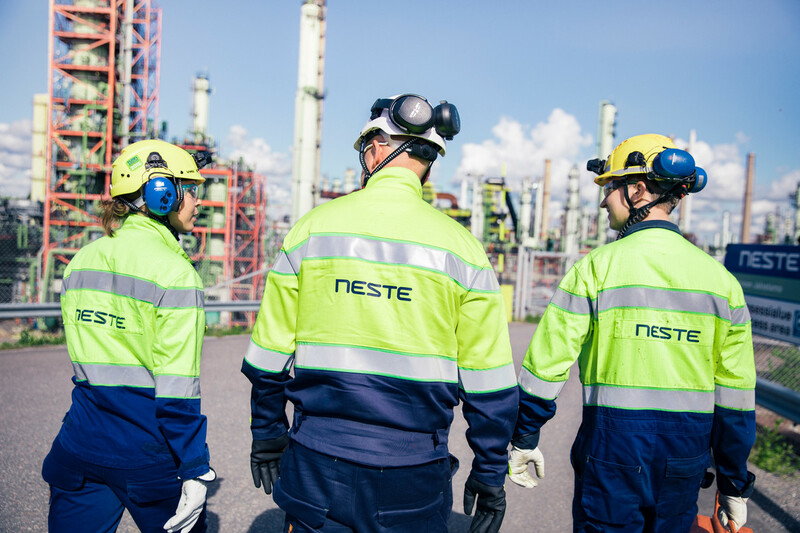 We launched a global induction model for new employees to introduce our values and strategy, our approach to ethics, code of conduct and safety, as well as development opportunities at Neste. The model received positive feedback in our “New hire” survey which we utilize to understand the motivation and employee experiences of new Neste employees. We are in a process of adopting a more agile approach to work. This is includes modifying our facilities to offer versatile spaces for work, as well as encouraging remote work and full-scale adoption of collaborative Google-tools, among others. Agile approach aims to support achieving of set targets by enabling employees themselves to select the best way of working depending on their individual tasks and the nature of their work. Employee well-being and work-life balance can be achieved better with increased flexibility. So far, the results have been promising. Based on the survey conducted at the headquarters in Espoo, Finland, the feedback has been positive: ”activity-based office” received a score of 4 (scale 1–5, 5 being the highest) while “flexible working” received an overall score of 8.9 (scale 1–10, 10 being the highest). In 2018, we will focus on strengthening adoption of these new ways of working.